Solebury School’s Head of School Tom Wilschutz, along with the faculty and staff would like to send a huge thank you to all of the local businesses, particularly in the New Hope, Lambertville, Buckingham, Newtown and Doylestown area for graciously donating so generously to our annual auction. Special recognition goes to Donna Cosgrove and Carolyn Dorph, who worked tirelessly as auction co-chairs to bring this lovely event together. Special recognition goes to Donna Cosgrove and Carolyn Dorph, who worked tirelessly as auction co-chairs to bring this lovely event together. Special thanks goes to our corporate sponsors, which include The First National Bank of Newtown, Princeton Brain and Spinal Care, LLC, Pegasus Emergency Group and Signs & Wonders Store, LLC. The auction raised over $120,000 this year, including more than $77,000 to create the Sycamore Patio, a thoughtful outdoor space for dining and learning that will be built this summer. The funds raised will allow us to make significant progress for the future including educational programming, student activities and facility improvements. So many members of our community made this night special and its impact will be felt by our students, faculty & friends for years to come. 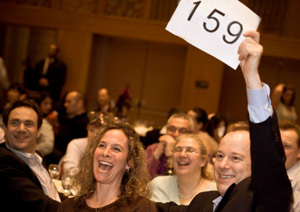 A special thank you goes out to auctioneer Erin Ward for making the auction such a success. The delicious food for the auction and alumni day was prepared by Solebury’s own chefs Carmen DiFoggio, Joe Kienzle and Pablo Naughton. And finally, thanks to all of Solebury School’s wonderful alumni, parents, faculty, staff and students for once again, making this auction a success.